After hearing from 65 speakers over two meetings, Vancouver city councillors have voted to tear down the viaducts connecting downtown to False Creek. 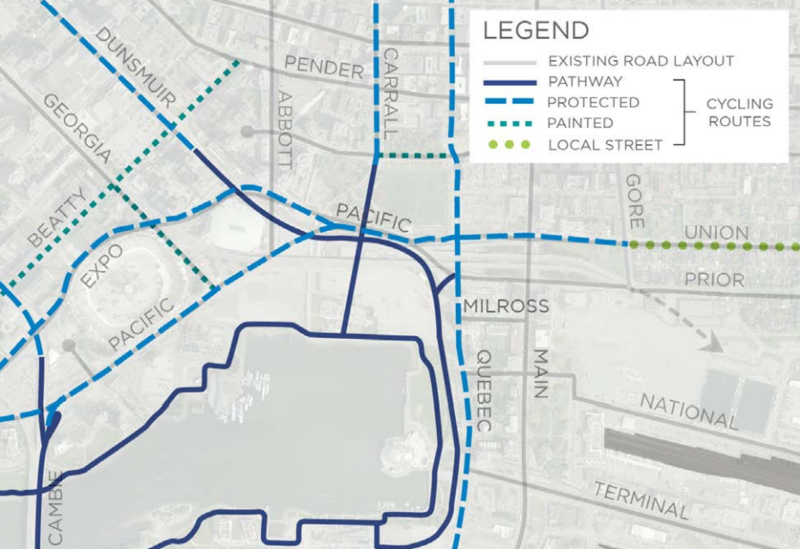 The $300 million project, which was initially estimated at $70 million, will involve demolishing the viaducts that were built in 1972 and replacing them with a new six-lane road configuration that merges Expo and Pacific boulevards. They will also build 2,500 affordable and market value housing units, a 13-acre expansion of Creekside Park, a bike bridge on Dunsmuir that connects to the escarpment, and a five per cent grade ramp at the end of Georgia Street between Rogers Arena and B.C. Place that leads to Pacific Boulevard. As well, contaminated soil that still remains in False Creek from the area’s heavily industrial past must be taken care of. “With the housing crisis that we face, it seems crazy that we would spend tens of millions of dollars to keep an elevated freeway in place on top of acres of city land rather than focus on housing for residents who need it,” Mayor Gregor Robertson said in the council meeting. Four city councillors voted against the plan to demolish the viaducts for various reasons that were mostly cost-related. Five councillors approved it, while Councillors Reimer and Jang were absent from the meeting. “Is this the best way to spend $200 to $300 million of people’s money in this city? We don’t really know where this money is coming from,” said City Councillor George Affleck, who voted against the proposal. According to city planners, the viaducts are seismically unsafe and only half of its 1,800 vehicle-per-lane-per-hour capacity is being utilized. Half of the viaduct’s traffic comes from the eastern half of the city. Citizens who were both opposed to and in favour of the removal of the viaducts voiced their opinions and worries. Some of them were concerned with Cottonwood Gardens, a community garden that will be damaged by the widening of Malkin Road, and how traffic flow will be affected. Many Cottonwood supporters urged councillors to route east-west arterial traffic to National Avenue instead. An east-west arterial was not decided on at the meeting, but the councillors voted not to make special moves to preserve the gardens. Many speakers of African descent supported the removal of the viaducts contingent on the preservation and restoration of parts of Hogan’s Alley, a historically black populated area of Vancouver that was torn down when the viaducts were erected. Now that the plan to tear down the viaducts has been approved, it will likely go forward in 2018 with the implementation of a two-phase plan that will take place over a period of five years. Demolishing the viaducts and building the roads are expected to take two years alone. Phase one is estimated to cost $200 million while phase two is estimated at $100 million. The source of funding for the project is undecided, but could come from a combination of capital reserves and contributions from developers. A funding strategy will be developed by city planners over the next 18 months. Another option that’s being considered is the construction of a streetcar system. The plan is expected to benefit cyclists. After construction, Carrall Street, the cycling facility on the new Dunsmuir connection to downtown, will be able to accommodate 10,000 cyclists per day. 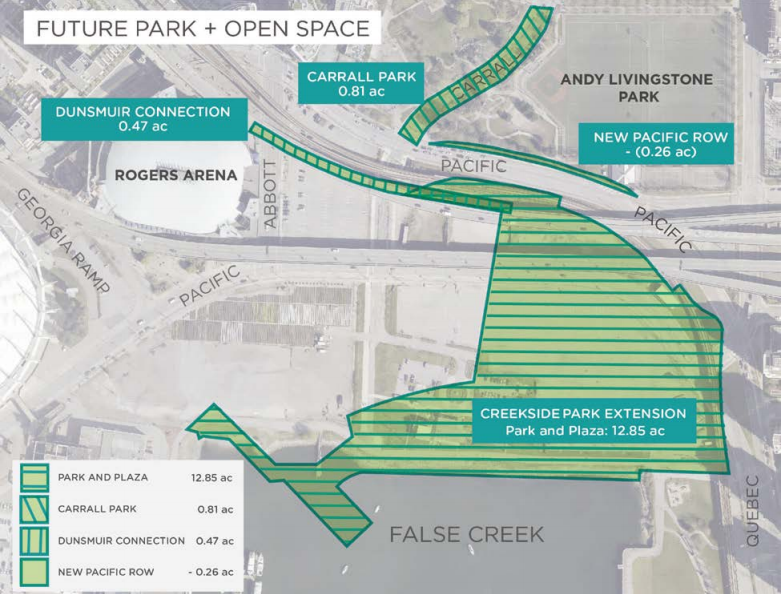 Many new parks and green spaces will be added in the Northeast False Creek area, including a 2.7 acre park at the Plaza of Nations site. Nearly 14 acres of park space would also be added in the new Creekside Park Extension, Carrall Street conversion to park, and Dunsmuir elevated park.